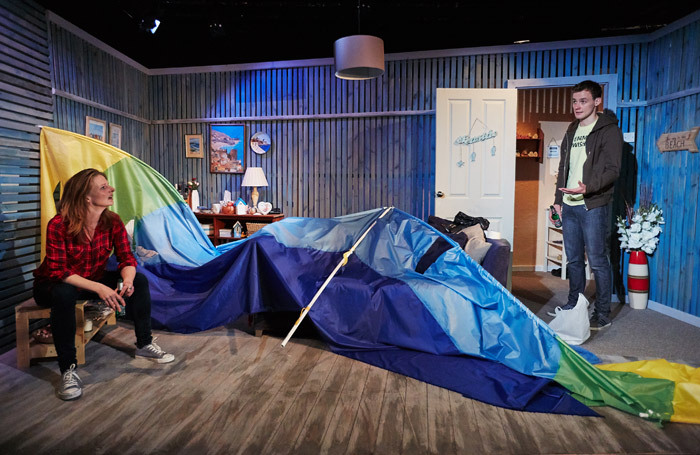 Theatre503’s latest is a finalist of the venue’s Playwriting Award for new writing in 2016, and Alison Carr’s ear for natural, funny dialogue distinguishes it from the outset. At Maeve’s seaside bed and breakfast, a young man, Simon, shows up unexpectedly to participate in the town’s annual hang-gliding competition. Her daughter Claire reluctantly puts him up, but she seems strangely stuck herself, not ready to leave despite her mum swearing she’s recovered after a recent stroke. Holly Pigott’s living room set is suggestive of a seaside pier. Ben Jacobs’ coloured lights seeps through the walls’ wooden panels hinting at the time of day, particularly during scene transitions and Claire’s bookending monologues. Everything from the art depicting the local beach to the sugar bowl under the coffee table adds to the cosy, safe feel. While the characters’ backgrounds are believable, the sheer amount of information delivered in a series of unrelentingly dark reveals make Caterpillar heavy-going. The plot twists, though shocking, comes at the cost of further exploring the far more interesting conflict of Claire’s character. The three performances are all excellent. Judith Amsenga convinces as the complicated Claire, Alan Mahon’s immaturity as guest Simon matches his choice of hang-gliding getup. As Maeve, partially paralysed after her stroke, Tricia Kelly is delightfully ribald. A slightly tighter focus from Yasmeen Arden’s production might rightfully centre the mother-daughter relationship and better underscore Carr’s wistful, tense ending.